Our gunsmithing department can drill and tap military actions for scope mount bases, alter feed rails, open bolt faces for standard magnum cartridges, modify bolt handles for scope clearance or install new, custom bolt handles. We provide barrel installation and finishing services, action modifications, etc. 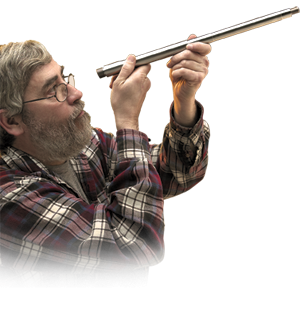 Your new Shaw barrel can be installed onto your supplied action by our in-house gunsmiths. Each action is trued before barrel installation, and other services may be requested such as the lapping of your locking lugs, installation of a new Timney trigger, bluing of your new barreled action, etc. Pictured below is a customer's action in progress with a helically fluted bull barrel and new Timney trigger. Let us alter your existing military bolt action handle for scope clearance. We can expertly install custom bolt handles on your action, or we can alter your existing bolt handle. Example: Standard military bolt handle. 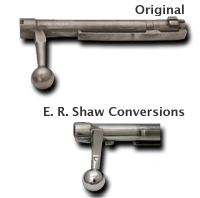 Right: Altered existing bolt handle (right), New Shaw custom bolt handle (left). Action modifications are for military actions only. The following alterations can be done.